An email was delivered to Cranmer’s Tower at 11.15am on Tuesday of this week. It was headed: ‘Record numbers attend cathedrals at Christmas’, followed by a very red, upper-case warning: ‘RELEASE AND STATISTICS EMBARGOED UNTIL 00:01 24/10/18’. Why should good news be embargoed? No idea. You can’t imagine Jesus telling his disciples: “I fed 5,000 on the plains of Bethsaida, but the stat is embargoed for 12 hours”, can you? Perhaps he might if he’d promised Mark an exclusive, but why would he do that? Don’t you want good news to be shouted immediately from the rooftops? Jesus rose from the dead, but the news is embargoed until… O, you get the gripe. It’s not as if any Church of England bad news is ever embargoed, and there’s an awful lot of that. But it is interesting, isn’t it, in a time of increasing secularity, idolatry, church decline and pervasive Godlessness, that the statistics on cathedral attendance show an increase. A total of 135,000 attended a Church of England cathedral to worship on Christmas Eve and Christmas Day in 2017 – an increase of three per cent on 2016, and the highest total since records began. But, interestingly, the growth isn’t only at Christmas. Attendances at cathedral Sunday worship throughout the year continue to hold steady, with average weekday attendances continuing a pattern of increase, with just over 18,000 attending in 2017, compared with 7,000 in 2000 when this data was first recorded. 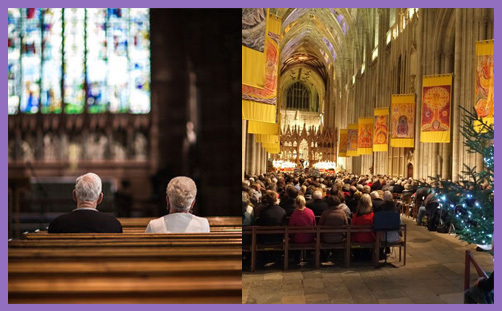 Over 10 years, the total number attending all regular services in cathedrals has increased by 10 per cent. The numbers attending a cathedral on Christmas Eve and Christmas Day has increased by 13 per cent over the past 10 years, evidencing sustained growth. Sir, With reference to your report “Stress drives workers to God” (Oct 24), whenever I visit cathedral cities, I try to attend evensong, but it won’t please the Church of England to learn that it is because I find greater solace listening to the beautiful voices of the choristers — in a largely empty church, untainted by the faltering voices of a congregation singing hymns. My favourite church for evensong is Wells Cathedral, followed by Chichester. This is an interesting point: where two or three are gathered in the local parish church, the singing is invariably dire – even when the congregation swells to 10 or maybe a dozen for midnight mass on Christmas Eve, it is still rather dispiriting. People seem to be drawn by a cathedral’s music of majesty and splendour, transported, as they may be, to a place of spiritual pilgrimage deep in the heart. Or perhaps they are drawn by the peculiar status of cathedrals, so that, far from seeking the spiritual authority of a bishop, what they really seek is a place outside episcopal jurisdiction. It is interesting that Royal Peculiars in particular continue to thrive as religious institutions: are people more attuned to the Queen’s jurisdiction than that of politicised (and often party-politicised) bishops? Maybe that’s it: a cathedral sermon by the dean is less likely to be lifted from the latest Guardian op-ed. Instead of being bashed about the head by the vicar’s tedious sermons on the holiness of gender equality, foodbanks, Palestine and the European Union, a congregation hears about Jesus, the God who became man, and contemplates him in silence, with reverence and awe, imbibing him into the bloodstream of spiritual refreshing, perhaps shedding a tear for the Anglicanism of memory and hope. O maybe the real reason cathedral attendance is soaring is that you can visit, pray, worship and meditate with complete anonymity. Nobody knows you, and no-one is likely to seek to know you because you have clearly gone to the cathedral to remain unknown. Your hand may be shaken, and people will smile, but no-one will probe your fragility or invade your vulnerability, because you radiate an air of unknowability. You care deeply about the communion of the saints, but not beyond bread and wine. In the cathedral, it is just your breath of faith, an encounter with truth, and a conversation with God. It is not a dream of a forgotten past or the fear of an insecure future; it is the needs of the soul right now. If you seek a divine source of strength, joy and holiness, cathedrals will draw your eyes through centuries of stained glass and point them toward the light which may be found today; ‘the true Light, which lighteth every man that cometh into the world.’ And when you have seen, you can leave without ever being known – except, of course, by Him.